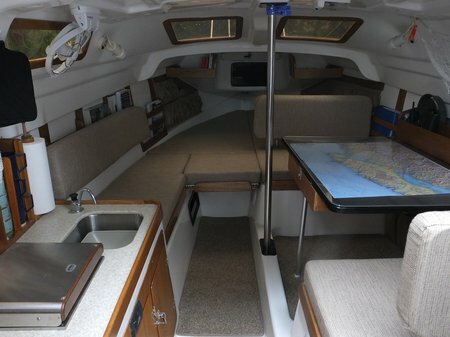 I can’t quite say when the idea of cruising our MacGregor 26x on the American Great Loop first took hold. I had been aware for some time that boaters could circumnavigate the eastern US via an all water route. In fact, we had actually sailed on several portions of the Great Loop on previous trips back east. However, once I discovered and started exploring the American Great Loop Cruisers Association (AGLCA) website I got seriously enthused. Sandy, however, had serious reservations. How could we manage to be away from the house and yard for the full year which such a cruise would take? How would we handle emergencies involving ourselves or family members back home? Could we actually become liveaboards on such a small boat for so long? And most importantly of all, how could she manage to be away from our grandkids for so long? Once workable solutions to these concerns emerged we committed to transforming the dream into reality. The actual process of preparation has been underway for several years. 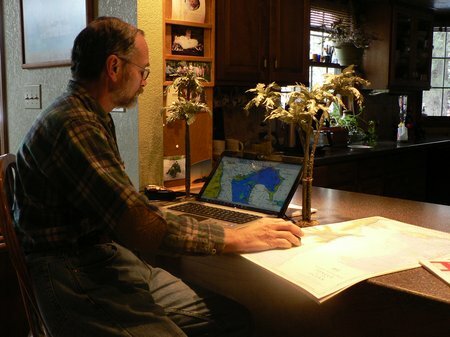 I started by accumulating a complete set of paper charts and cruising guides, which is no small task in itself. The route is more than 6000 miles in length, extending from the Great Lakes down to the Gulf of Mexico via rivers, locks and canals, then by intracoastal waterways to Florida and up the east coast of the US to New York, and again by rivers, locks and canals north to eastern Canada and back onto the Great Lakes. Some charts and guides I purchased new while others I got used through the AGLCA website. I filled in some gaps by downloading and printing NOAA and Corps of Engineers charts, which I made into custom chart notebooks. Altogether, these paper charts and cruising guides filled 3 sizeable plastic tubs and weighed over 70 lbs. With these materials in hand, the process of route study and selection and tentative itinerary commenced. We decided to start on Lake Michigan, at the town of Grand Haven, because a good friend who lives there was kind enough to offer us a place to park our truck and boat trailer for the year long cruise. This then dictated the approximate starting date of late August, enabling us to reach Chicago by Labor Day. My reading had pointed out the importance of getting off Lake Michigan before the more unsettled fall weather pattern sets in. Most sailboats doing the Loop must unstep their mast at Chicago and either have it trucked to Mobile AL or lash it down on deck for the trip south, due to low fixed bridges along some of the rivers. We, however, can lower and raise our mast while underway, thereby allowing us to sail whenever we have favorable winds on the inland rivers and lakes. I identified some key dates, targeting our arrival at Mobile Bay around Nov. 1, which is near the end of hurricane season. This would enable us to select a favorable weather window for the 170 mile open water Gulf of Mexico crossing to Tarpon Springs FL and sail around the Florida penninsula to Miami in time to fly home for the holidays. We could spend the balance of winter in the Bahamas and time a spring cruise up the Atlantic Intracoastal Waterway (ICW) for arrival on Chesapeake Bay around the first of May. I developed a plan for flying Sandy home for a couple weeks of grandparenting time while I brought the boat up Chesapeake Bay with friends. She would meet up with me at Baltimore, and the cruise would continue down Delaware Bay, up the New Jersey coast, into New York Harbor, up the Hudson River and north to Canada via Lake Champlain. We would take the historic Rideau and Trent/Severn Canal routes across southeastern Canada to the Georgian Bay on Lake Huron, and from there back to Lake Michigan and our point of beginning. I projected the entire voyage to take approximately 13 months. The next step involved assessing the boat to identitify a list of modifications, improvements, upgrades, and replacements which would enable us to function as liveaboards on this cruise, with the maximum degree of safety, comfort and convenience. Inevitably, conflicting parameters arose, requiring compromise and creativity. Checklists were prepared and, in January of this year, work commenced in earnest. We tackled a complete interior remodel. I installed a new stainless sink and corian countertop and Sandy sewed up new cabin cushions. We replaced the old worn out foam with new, high quality foam which adds greatly to comfort while sitting and sleeping. These were both very major projects. We also replaced carpet and I dressed things up with mahogany trim around the windows, countertop, and seats. Sandy sewed up custom fabric organizers to conveniently store shoes and clothing in. We became obsessive in creating storage out of every open surface and obscure cranny. 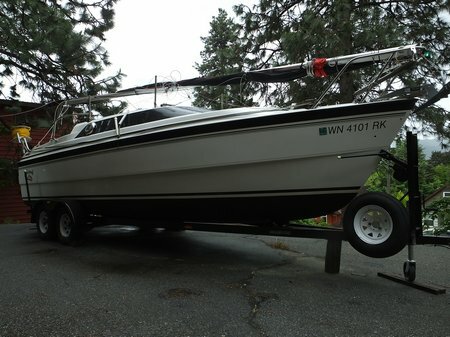 Exterior projects included having our dealer apply barrier coat and bottom paint to the hull. While this was being done, I got the trailer sandblasted and repainted, and then installed new bunk carpet, wiring, and LED lights. I made improvements to my anchor setup and came up with a system for quickly rafting the dinghy up to the side of the boat in preparation for anchoring, docking, or locking. As the work proceeded, old checklists were replaced by new ones, however, as I write this, preparation of the boat, truck and trailer is nearly complete, leaving us with just over a month to focus on preparing the house and yard for our prolonged absence, provisioning and stowing of things on the boat, and attending to a myriad of details like bill payment, mail forwarding, and final visits with family and friends. Determining what to do about the house and yard was a major challenge. We quickly dismissed the idea of renting it out, having had unfortunate previous experience with that option. We settled on simply locking the place up with the heat set on low, keeping key utilities like water, sewer and power turned on (that way the automatic sprinklers would operate), and hiring a yard maintenance outfit to mow the grass, rake up leaves, and shovel some snow. However, a couple of weeks ago a better solution dropped right in our laps when we learned that a long time friend was in need of a place to live for the next year. After talking with her, it became obvious that the fit was perfect, so we now have the ideal house sitter. As for the house itself, lately it seems as if it has other ideas. It’s been behaving like a little puppy who messes things up when you go off and leave him behind in the house. Following our recent shakedown cruise, we returned home to discover that the pump for our outdoor pond had quit and one of the valves for our automatic sprinkler system had failed. The heat wave while we were gone had burned the lawn to a crisp. And yesterday Sandy mentioned that the electric garage door wouldn’t close. Just when I really want to work on preparations for the cruise, I’m having to spend time fixing house things that have operated flawlessly for decades.